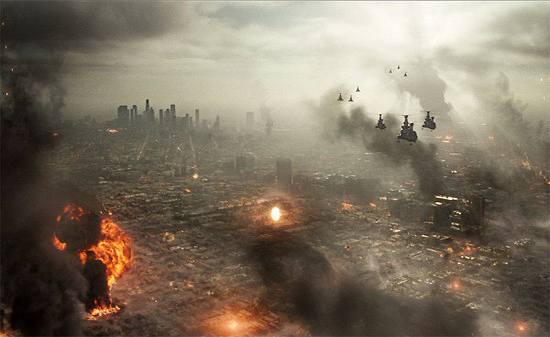 Director Jonathan Liebesman Reveals 'BATTLE LOS ANGELES: 2' is in the Works! Battle: Los Angeles, although a slick well paced summer blockbuster that admittedly at one point looked like a sleeper hit -merely ended up suffering at the last hurdle. A typical all out action flick which suffered style over substance. Well maybe there lies redemption in the franchise in a sequel? A sequel is in the works. Director Jonathan Liebesman while doing the press rounds for Wrath of the Titans revealed to Collider what stage the sequel was at. Hit the jump for the details. Jonathan Liebesman: "We’ve just started the script now, so that’s where we are. We have just begun the script. Just because I don’t want the studio to get pissed at me, I’m not sure what I can and can’t say about it. But what’s exciting is it sounds like the budget will be as big. They’re really going to make it an event." It will be interesting to see if Sony will green light this one. I'm reading: Director Jonathan Liebesman Reveals 'BATTLE LOS ANGELES: 2' is in the Works!Tweet this!